Junia or Junias (Greek: Ιουνια / Ιουνιας, Iounia[s]) was a 1st-century Christian highly regarded and complimented by apostle Paul. Paul probably refers to Junia as an apostle. The consensus among most modern New Testament scholars is that Junia was a woman. 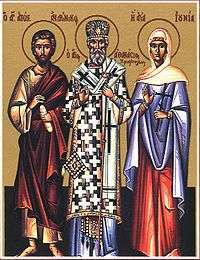 The majority of Greek New Testament manuscripts give a female name, Junia; a minority give a masculine name, Junias. The phrase translated "of note among the apostles" (KJV) can be read two ways, as illustrated by the two readings in the NIV; "outstanding among" (NIV main text) or "esteemed by" (NIV footnote). These two questions are still under scholarly debate. Grammatical issue: "prominent among" or "well known to"? The meaning of "outstanding among the apostles" is rendered by some translations as "well-known to the apostles"—suggesting that the couple were not apostles but enjoyed a high reputation among the apostles. Some New Testament scholars consider that the Greek phrase episêmos en + dative (literally "noted among") does not automatically demand that the noted person is a member of the group among whom the person is noted. A well-known example of this grammatical construction is found in Euripides' Hippolytus 101:3 where the goddess Aphrodite is "famous (episêmos) among mortals," but evidently is not included as being among the mortals. For this reason some versions, such as the ESV, translate the Greek phrase as "well known to", unlike other versions such as NRSV which translate "prominent among." Those who have argued for the ESV translation include Michael Burer and Daniel Wallace who agree that Junia was a woman but assert that the correct rendition of the Greek text places her as well known to the apostles rather than prominent among the apostles. That translation would indicate that the pair were not apostles, but that they enjoyed a high reputation among the apostles. Linda Belleville, Richard Bauckham, and Eldon Epp, who take the reading 'prominent among', have taken on the task of correcting some findings pertaining to Junia. Bauckham devotes several pages to interacting with, refuting, and correcting the Burer and Wallace article. Vulgate "salutate Andronicum et Iuniam, cognatos et concaptivos meos, qui sunt nobiles in apostolis,..."
KJV "Salute Andronicus and Junia, my kinsmen, and my fellow-prisoners, who are of note among the apostles,..."
NRSV "Greet Andronicus and Junia, my relatives who were in prison with me; they are prominent among the apostles,..."
ESV "Greet Andronicus and Junia, my kinsmen and my fellow prisoners. They are well known to the apostles,..."
Classicist Evelyn Stagg and New Testament scholar Dr. Frank Stagg believe that Paul is competent to endorse the couple as "apostles" on the basis of his own involvement with them. Bilezikian:p.301–302 #54 agrees. Paul's references to the couple's imprisonment with him and to the time of their conversion relative to his own would give him no need to defer to the opinion of others as a source of credentials. He writes that Paul would have little interest in deferring to the opinion of others as a source of credentials. The Staggs and Bilezikian maintain that both the context and the content of this verse require that it be read naturally as Paul's commendation of Andronicus and Junias not only as remarkable Christian workers, but as members of the larger group commonly called "apostles" such as Silas, Timothy, and others. Richard Bauckham argues for identifying Junia with Joanna, the wife of Chuza, "Joanna" being her Jewish name, and "Junia" her Roman. The first discussion proposes that Junia was a Hellenised Jew, and that she belonged to Paul's Law-free mission to the Gentiles. In that scenario Paul is seen to be reinforcing the couple's gospel by praising them. The other possibility is that Junia belonged to the more conservative element of the early Christian movement such as Jewish Christianity (Jews that still maintained the importance of the Jewish Law). Junia was a popular name for nobility. It is also of note that Junia possesses a Latin name which could have stemmed from servile origins. This could mean that she was a freed slave who adopted the name of her patron. Alternatively as previously mentioned, Junia could have belonged to a family of Hellenized Jews. According to Harry Leon, it was commonplace during this period for Greek-speaking Jewish families to give their daughters Latin names and their sons Greek names, hence the Greek name of Andronicus. Further, 75% of the 517 names found in the six Jewish catacombs of ancient Rome are Greek names. Junia's relationship with Andronicus is somewhat ambiguous. While it is generally supposed that they were husband and wife, they could have been siblings or simply a team of evangelists. What is important is that Junia is referred to in her own right, not as an attachment to someone else. This means that she earned her title and position on her own merit, rather than it being simply a natural derivation from her husband's status. A popular work exploring Junia has been published by journalist Rena Pederson. This book has been reviewed in the Toronto Star. The opposing interpretation of this verse disavows both Junia's apostleship and her female gender. Complementarians believe that the Bible limits or prohibits women's leadership roles in the church, and requires male leadership/female submission in marriage. The consensus among some modern New Testament scholars is that Junia was a woman. The first reference to Junia as a male comes from Origen (late 2nd early 3rd century). This is also the earliest comment on Junia´s gender in general. However, this version only appears in a relatively late Medieval copy of Origen´s work, which appears to originally speak of Junia as a female. In the 4th century Junia is considered male by Epiphanius of Salamis. There are, however, doubts about the reliability of his opinion, since he provides the wrong gender for Prisca, another biblical character. There are later references as well, e. g. Aegidius of Rome (ca. 1243-1316) in the late Middle Ages, though without explanation. Two centuries later, in 1512, Jacques LeFevre also considered Junia a man, even though in the Latin translation available to him the name was clearly feminine. U.S. journalist Rena Pederson argues that medieval translators such as the 13th-century Archbishop Giles changed her name to Junias, as a reflection of an institutional prejudice against women that stretched back to ancient Greek scholars. She opines that the growing acknowledgment of Junia's female apostleship will establish an important precedent for women preaching and teaching. "And since Paul often has been viewed as someone who wanted to keep women quiet, his praise for Junia seems to show that he was much more broadminded in practice," Pederson adds. Stephen Finlan notes that in the Corinthian and Roman letters, Paul addressed a number of women as "leaders". However, Finlan also affirms that Junia is “the only female apostle named in the New Testament.” He writes that Junia is clearly a female name that was changed to the male "Junias" in the Latin translations of the New Testament. In Paul's identification of her as a relative, as being "in Christ" before him and being "prominent among the apostles," Finlan finds it significant that Paul greeted her as an "apostle" in a straightforward, matter-of-fact way as if there was nothing unusual about a female apostle. In the Corinthian and Roman letters, Paul addressed a number of women as "leaders," but Junia is the only female apostle named anywhere in the New Testament. The problem of translating the name arises because, when the New Testament was composed, Greek was normally written without accents, although these already had been invented. If written with an acute accent on the penultimate syllable (Ἰουνίαν), the name is "Junia" (a woman's name); if with a circumflex accent on the final syllable (Ἰουνιᾶν), it is "Junias" (a man's). No conclusion can be drawn from the masculine gender of the associated words in the same verse, since they apply also to the male Andronicus. Accordingly, even if Junia(s) is a woman, the rules of Greek grammar put those words in the masculine form. The overwhelming choice of the male form (Ἰουνιᾶν), when in the 9th century accents were added in manuscripts, may have been influenced by the grammatical gender of these words, but it has also been attributed to a supposed bias on the part of scribes against the idea of a female apostle. In his book Junia: The First Woman Apostle, Epp gives a textual critical evaluation of the history of Junia in the Greek text and also the search in non-Biblical Greek literature for "Junias"─the alleged masculine form of the name which has not been found in writings from New Testament times and only rarely thereafter. He points out that the earliest copies of the Greek texts for Romans 16:7 are majuscules (capital letters). There are no accent marks in them. The importance of this is that the gender of the name depends on the accentuation. Hence, the earliest texts are inconclusive and we are very dependent on Patristic interpretation for the gender of Junia. When the minuscules (using lower case Greek letters) appeared, Junia was accented with a character which indicates the feminine form of the name. The feminine form of the name appeared in Erasmus' critical Greek text in 1516 and continuously thereafter in all other critical Greek texts, with the exception of Alford's 1858 edition, until 1928 when Nestle inexplicably (read: he didn't explain it in the apparatus) went to the masculine form. This remained the case until the 1998, when the edition just as inexplicably went back the other way and the masculine was dropped as even an alternative (not in the apparatus). Hence, the textual weight seemed to be for the feminine name Junia, which text critic Eldon Epp in 2005 believed most scholars accept. However, the masculine form is preferred in the UBS New Testament, 4th edition, which matches the 27th edition of the Nestle-Aland text (the latest editions of each text). Only one record of the male name "Junias" has been discovered in extra-biblical Greek literature, which names him as the bishop of Apameia of Syria. Three clear occurrences of "Junia" have been found. While earlier searches for "Junias" in Latin also yielded no evidence, it is reported that "Junias" has been found as a Latin nickname or diminutive for the name "Junianas", which was not uncommon both in Greek and Latin. While this is a possibility, historical studies on the name "Junia" as a contracted form of "Junianas" has shown there are over 250 citations of the name Junia in antiquity all of which have been found to refer to women, with not one single case proven to be the abbreviated form of Junianus to Junia. Meanwhile, the name Junia is attested multiple times on inscriptions, tombstones and records; most notably, General Brutus’ half sister, Junia. Among the early Church Fathers, the United Bible Societies The Greek New Testament only cites Jerome as having read the name "Julia" in Romans 16:7 and Chrysostom as having understood the name as the feminine "Junia". Chrysostom wrote: "O how great is the devotion of this woman that she should be counted worthy of the appellation of apostle!" Although among the Fathers, "an almost universal sense that this was a woman’s name surfaces—at least through the twelfth century, ... this must be couched tentatively because although at least seventeen fathers discuss the issue (see Fitzmyer’s commentary on Romans for the data), the majority of these are Latin fathers," and "Junia", but not "Junias", was a common enough name in Latin. It has even been claimed that the first known mention of Junia as a male is by Aegidus of Rome (1245–1316), though this ignores the evidence of the Greek manuscripts about how the name was actually interpreted at least from the 9th century onward. The Coptic Synaxarium reading for the twenty-third of Bashans identifies Junia the apostle as being a man of the tribe of Judah. Epiphanius (315 - 403 AD), in Index of Disciples says, "Junias, of whom Paul makes mention, became Bishop of Apameia of Syria." In Greek, the phrase "of whom" is a masculine relative pronoun (hou) and shows that Epiphanius considered Junias to be a man. And in a Latin quotation from Origen (died AD 252), in the earliest extant commentary on Romans, says that Paul refers to "Andronicus and Junias and Herodian, all of whom he calls relatives and fellow captives" (Origen's Commentary on Romans, preserved in a Latin translation by Rufinus, ca. 345-ca. 410 AD, in J.P. Migne, Patrologia Graeca, vol. 14, col. 1289). The name Junias here is a Latin masculine singular nominative, implying that Origen, who was one of the ancient world's most proficient scholars, thought Junias was a man. In a 2008 JBL article, Al Wolters argued that Iounian was the Jewish name Yehunni, which is a man's name. He has been followed in this by Bruce Waltke. Orthodox traditions say Junia and Andronicus of Pannonia traveled extensively and preached the Gospel to pagans, many of whom were converted to Christianity. Many of the pagan temples were closed, and in their place Christian churches were built. Junia and Andronicus are believed to have suffered martyrdom for Christ. The female identity of Junias was accepted without objection during the first twelve centuries of the church, according to the writings of the church fathers. Paul's "enthusiastic acclamation" of Junia prompted Chrysostom, prominent Church Father, to marvel at her apparent devotion such that "...she would be even counted worthy of the appellation of apostle.” Some scholars see Romans 16:7 as proof that Paul the Apostle, whose name is ascribed to fourteen epistles in the New Testament, encouraged female leaders in the Church. A number of more recent translations present both Andronicus and Junias as males. Most recent studies, however, are preoccupied with the gender of the name, and not so much with apostleship. 1 2 Al Wolters, "IOUNIAN (Romans 16:7) and the Hebrew name Yĕḥunnī," JBL 127 (2008), 397. ↑ Keith Elliott, Ian Moir -Manuscripts and the Text of the New Testament: An Introduction 2000 Page 66 "GNB and REB also note the alternatives Junia'/'Junias' at Romans 16:7. The difference between the genders in the Greek depends on the accents and, as early manuscripts were written without accents, .."
↑ H.E. Jacobs Andronicus in International Standard Bible Encyclopedia: A-D - Page 123 Geoffrey W. Bromiley -1939 revised 1979 "are referred to as "of note among the apostles," this may be interpreted either as designating the high esteem in which they were held by the Twelve, or as reckoning them in the number of the Twelve, or as reckoning them in the number of apostles. The latter is the sense, if "apostle" be understood here in the more general meaning, used in Acts 14: 14 of Barnabas, in 2 Cor. 8:23 of Titus, in Phil. 2:25 of Epaphroditus,." ↑ Charles Segal Euripides and the Poetics of Sorrow 1993 Page 124 "Aphrodite has a temple at the city's summit and a statue before the house, in the presence of which she is declared "conspicuous" (episêmos) among mortals (101-3). " ↑ Eldon Jay Epp The Junia/Junias Variation in Romans 16.7: in New Testament Textual Criticism and Exegesis: Festschrift J. Delobel. Ed. Adelbert Denaux, Joël Delobel" p287. "in Euripides, Hippolytus, l03, Aphrodite is described as "prominent/splendid among/to mortals", where the exclusive view is apparent because she is not a mortal"..."Though questions remain, Burer and Wallace viewed the inscriptions as furnishing four personal en + dative instances ... From classical literature three examples were given; the first is impersonal (Lycurgus, Against Leocrates, l29), the second personal (Euripides, Bacchae, 967), ... The fifth example, from Josephus (B.J., 2.4l8), ... "
1 2 3 4 Hammer, T. "Wealthy Widows and Female Apostles: The Economic and Social Status of Women in Early Roman Christianity," in G.D. Dunn, D. Luckensmeyer & L. Cross (ed. ), Prayer and Spirituality in the Early Church: Poverty and Riches, 5 (Strathfield: Paulist Press, 2009), 65-74. ↑ Hengel, M., Acts and the History of Earliest Christianity. tr. J. Bowden. London: SCM Press, 1979. ISBN 978-1-59244-190-7. pp. 107-108. ↑ Gillman, F. Women Who Knew Paul. Collegeville MN: Liturgical Press, 1992. ISBN 978-0-8146-5674-7, p.68. ↑ Leon, Harry J. The Jews of Ancient Rome. Peabody, MA: Hendrickson, 1995 p.94. ↑ "Becoming Junia - again | Toronto Star". Thestar.com. 2007-08-09. Retrieved 2013-10-04. ↑ "A study on Junia (Question 38)". Fifty Crucial Questions. Council on Biblical Manhood and Womanhood. Archived from the original on 2007-07-02. Retrieved 2014-07-17. ↑ Belleville, L., ‘Women Leaders in the Bible,’ in Discovering Biblical Equality: Complementarity without Hierarchy, ed. R. Pierce & R. Merill Groothuis (Downers Grove, IL: InterVarsity Press, 2005), 110-126. ↑ "Synaxarium" (PDF). Archived from the original (PDF) on 2009-03-27. Retrieved 2014-07-17. ↑ David Scaer, "Was Junias a female apostle? maybe not," CTQ 73 (2009), 76. ↑ Bruce Waltke, An Old Testament Theology, 241. 1 2 Nicole, Roger. "The Inerrancy of Scripture." Priscilla Papers, Vol. 20, No. 2, Spring 2006. Wills, Garry (2007). What Paul Meant. Penguin. pp. 90–92.